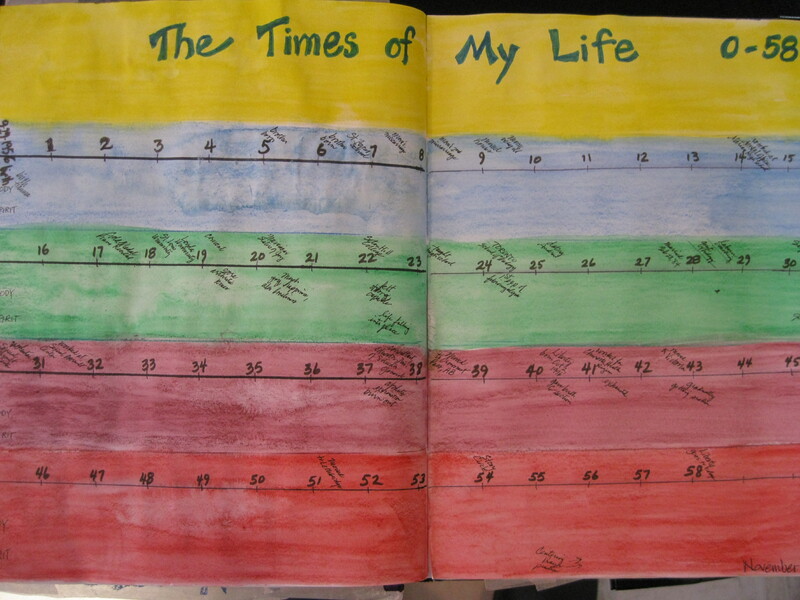 Today I want to encourage you to make a timeline of your life, with three “threads” of events. These threads are braided in each of our lives, and it’s helpful to become conscious of them and their interconnectedness. On one side of the timeline, write in the major events of your life so far. Events such as where and when you were born, major moves, high school graduation, first job and/or college, marriage or significant relationships, death of grandparents or parents, etc. These would be all the things you would eventually share with a good friend. On the other side of the timeline, write in the major events of your physical body so far. Starting with your birth, note if it was particularly complex or traumatic. Record major illnesses or accidents that you remember. Also, very importantly, write in the pleasurable bodily events: experiences of the warmth of the sun, being sheltered by a tree, the pleasure of swimming, first sexual experiences. Include the birth of children, chronic conditions, things like that. On this same side of the timeline, but in a separate stream, write down whatever you would call the spiritual or soulful events of your life: baptism or confirmation, “Sunday school” or other religious instruction, a moving experience in nature, feelings of essential “rightness” in the world, feelings of God’s presence, however you might describe that. Include times of trial and doubt, times and places you perhaps searched for life’s meaning, moments of despair, even when or if you left your religious heritage or decided you were an atheist or agnostic. Tomorrow we will ask some questions of these timelines. For now, record the facts, ma’am, just the facts. In the photo above, I have included how I set up the timelines, though I’ve omitted most of my personal details.